This 2016 image courtesy of the photographer Laurie Mulrine; it was 1st posted here: SAR Class 7: 970, Riversdale, Western Cape. 09.03.2016. 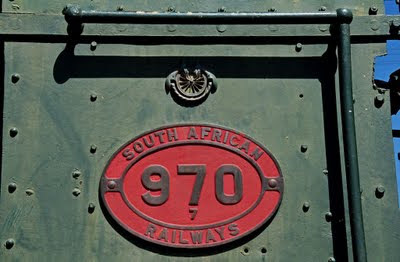 This locomotive, SAR no 970, is said to have done service on the Touws Rivier-Ladismith branch line until it's boiler certificate expired in May 1971. 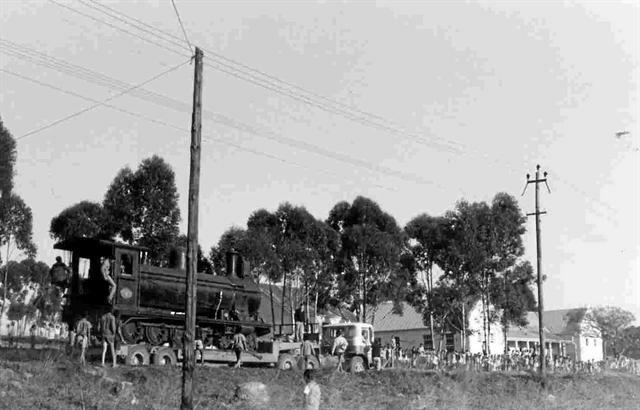 This locomotive was donated to the Riversdale Municipality, and arrived at Riversdale station on 21 January 1977. 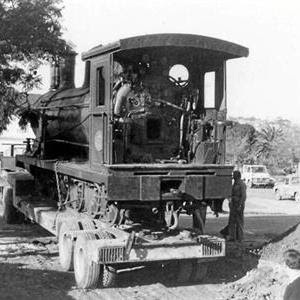 In June 1977 the locomotive was transported (pictures way down below) on a low bed trailer to where it is on display today. This class 7 locomotive SAR #970 was photographed on 20 October 2007 in the business centre of Riversdale. In 2007 the locomotive is in a surprisingly good condition and well cared for compared to some others we have seen. However in 2017 it is definitely in need of some good restoration attention!!! (As my 2011 report [below] highlighted). The first six were delivered by Dübs and Co in 1892. This was followed by an order for 32 from Neilson and Co, which were delivered in 1892 and 1893, and placed into service in the Cape Midlands and eastern sections and classified Class 7 by the SAR. 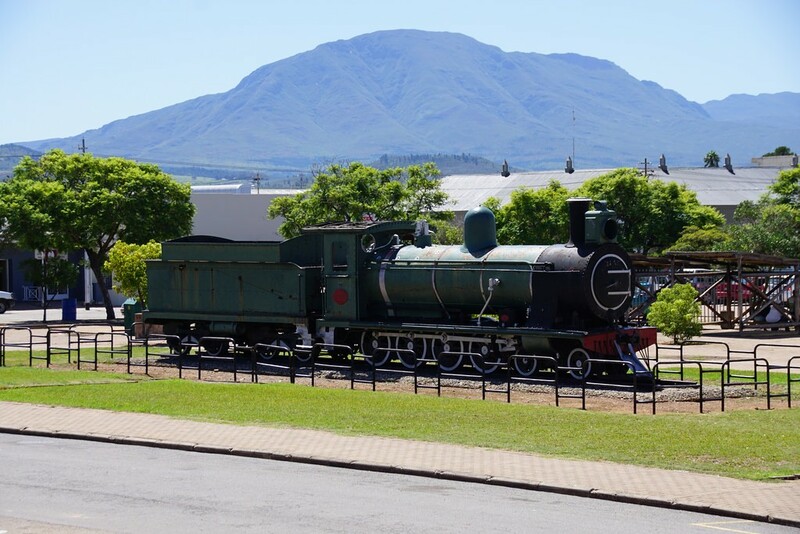 This SAR Class 7 no 970 is plinthed in the business center of Riversdale. It was built by Neilson & Co as works no 4450 in 1892. This old steam locomotive is an example of a class 7 loco - members of this class used to be regular visitors to the Riversdale station. The class had an excellent design, with strong construction, and was well loved by their crews. The locomotives were dependable while hauling mixed passenger and goods trains between Worcester and Mossel Bay. The branch line from Worcester was opened up to Riversdale on February 19, 1904, and on July 25, 1907 the line was joined at Voorbaai (Hartenbos) with the George - Mossel Bay line (still under construction at the time). In those years the branch line between Worcester and Mossel Bay was operated by the New Cape Central Railways (NCCR), a private company created in 1893, with headquarters and railway repair shop in Robertson. 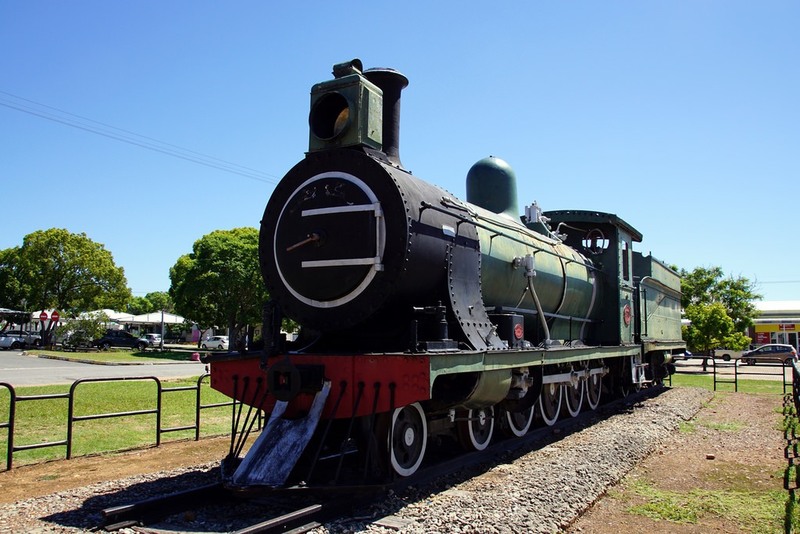 The NCCR was a successful concern which existed until 1925, when it was sold to the South African Railways (SAR). At the time this was the longest branch line in South Africa operated by a private company. Between 1899 and 1904 the NCCR acquired seven class 7 locomotives - their NCCR numbers running from 1 to 7. When taken over by the SAR these locomotives were re-numbered to class 7E no's 1344-1350. In 1913 the NCCR ordered another three class 7 loco's and they were numbered 9-11. Under the SAR they became class 7F no's 1357-1359. 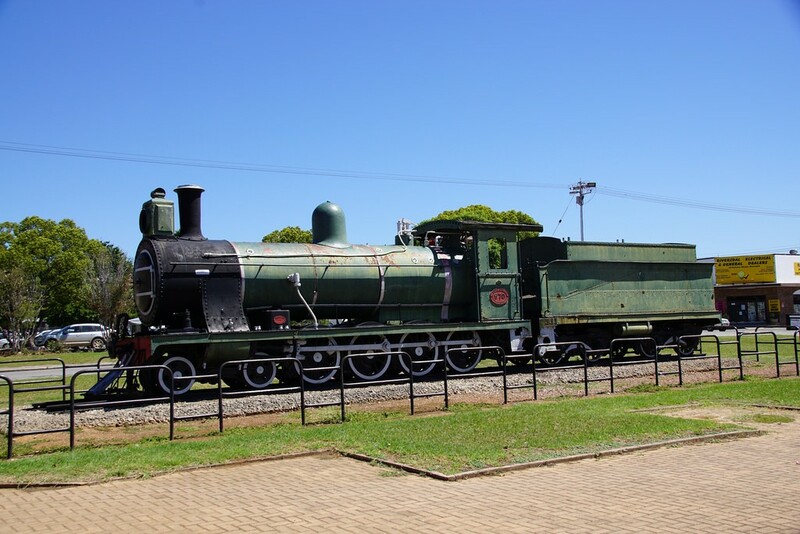 During 1907 the NCCR started a daily train service between Worcester and Mossel Bay, using their fleet of class 7's. The NCCR locomotives were well maintained, and under the SAR these locomotives kept working on the branch line - and would be a familiar sight in the Riversdale station - at least until 1931, when the line was upgraded to employ heavier locomotives in the form of the class 14CR, of which a fine example is plinthed next to Ashton's main street. 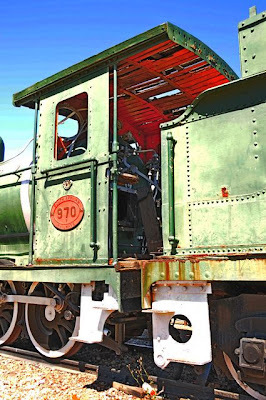 The class 7's were used on every system of the SAR - examples are plinthed at Matjiesfontein, George Outeniequa Museum, the Boer War Museum in Bloemfontein, and at stations at Klerksdorp, Prieska, Upington and Keetmanshoop. At least 134 class 7 loco's were built between 1892 and 1913. When the South African troops invaded German South West Africa (SWA, now Namibia) in 1914 during WW I, 29 class 7's were dispatched to do duty in SWA - they were so successful that by 1948 53 members of this class were active in the territory. The last members of the class 7's did service on the Ladismith & Tarkastad branch lines. During 1972 the last of these fine engines were retired. Sadly not a single NCCR loco's survived the march of time - therefore another class 7 locomotive in the form of SAR no 970 had to stand in when a locomotive to remember Riversdale's former history was donated to the town. This locomotive was built in 1892 as no 703 for the Cape Government Railways (CGR) and first put in to service on the CGR's eastern system at East London. 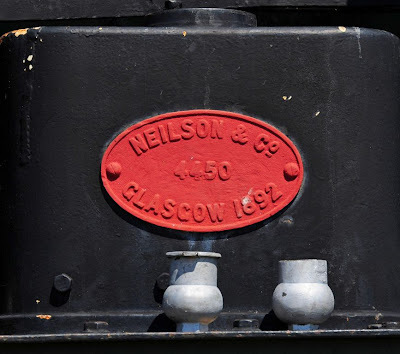 After Union in the engine was renumbered to SAR no 970. 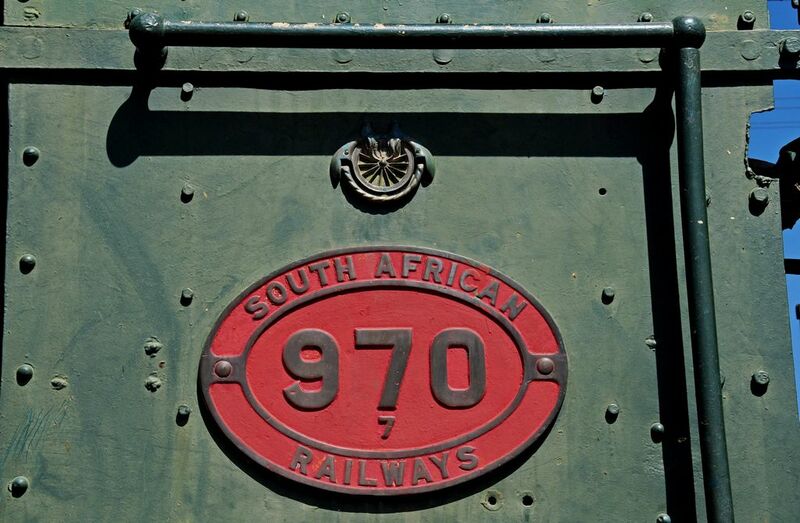 You may also compare this Class 7 locomotive with no 950 at Upington, no 975 in Bloemfontein (Anglo-Boer War Museum) and no 987 at Matjiesfontein. The locomotive is now begging for a complete repaint job. Also the cab's roof is a sorry sight! Big repairs are needed. The last boiler certificate expired on 4th May 1971. The following Afrikaans language article has been published here first. 07:00 (GMT+2), Thu, 28 June 2012 in the SOUTH CAPE FORUM. RIVERSDAL NUUS - Wie kan dan nou vergeet van ou Makadas wat sy plek op die plein volstaan. Makadas is deur die SA Spoorweë aan die munisipaliteit van Riversdal geskenk en kosteloos vervoer om as monument opgerig te word. Sover bekend is Makadas deur die Suid-Afrikaanse Spoorweë aan die munisipaliteit van Riversdal geskenk om as monument opgerig te word. Hy het wel tussen Touwsrivier en Ladismith geloop, maar wat die rede vir die besluit was is ongelukkig onbekend." Mnr. J L Steyn, 'n masjinis van Riversdal, het die lokomotief daarheen gesleep en op Woensdag, 21 Januarie 1977 het dit veilig op Riversdal aangekom en is gedurende Junie 1977, 35 jaar gelede van die stasie na die plein verskuif. Dit het 'n wielsamestelling van 4-8-0 tipe en was nog in 'n puik toestand. Met die oprigting het mnr. H.W. Storm, 'n masjinis, gehelp om dit reg te monteer. Die lokomotief Nr. 970 is in 1892 deur mnre. Neilson en Kie van Glasgow vervaardig. Die lengte van buffer tot buffer was 15.270 m met 'n trekkrag van 8471,632 kg en 'n ketel druk van 74,675 kg. Die totale gewig is aangegee as 40,94 ton en die steenkool-kapasiteit is sowat 8 ton. Die lokomotief is tot voor sy skenking op die Touwrivier-Ladismith sylyn gebruik waar dit die naam Makadas gehad het. Sy werksvervaldatum was 1971. Die koms van die naam het twee oorspronge een word vertel dat 'n haastige Engelse passasier vir die masjinis gegil het "Make a dash". Andere het te vertel dat 'n omgekrapte passasier van die lokomotief gesê het, "It is all muck and dust." Vandag dink ons terug aan die dae toe dit 20 sjielings gekos het om met Makadas te ry. Hierdie ou strydos is steeds nie vergete nie. When was Thomus Wolhuter a machinist on this loco?